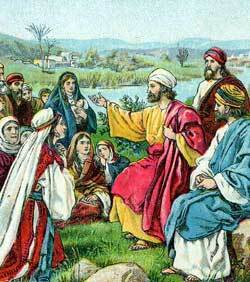 Paul teaches the people about God by the riverside. ONE DAY PAULsaid to Barnabas, “Let us go again to visit the brethren in the Gentile countries.” Barnabas was willing, so they arranged to start at once. Now, John Mark, the nephew of Barnabas, had come to Antioch again and wished to go with them on their second journey. He had started with them on their first journey but had turned back; so Paul did not care to take him this time. Barnabas, however, thought it would be well to take the young man, even though he had turned back the first time. So he took Mark for his companion and Paul chose Silas, the preacher from Jerusalem, to go with him. Barnabas and Mark went to the Island of Cyprus, while Paul and Silas went farther on, to the churches in Asia Minor. When they came to Lystra, the town where Paul had been stoned, they found a young man named Timothy whose father was a Gentile, though his mother was a Jew. This young man was an earnest believer in Jesus, and Paul was pleased with him. Timothy joined Paul and Silas, going from Lystra to other cities where the gospel had been preached. And he continued with Paul for a long time, loving him as a father. Years afterwards, when Paul was shut up in prison he wrote beautiful letters to Timothy, showing how great was his love for this faithful young man. The missionaries did not stop at every place to preach, because the time had not yet come when the people were ready to receive the gospel. The Holy Spirit caused the missionaries to understand this, and they passed on to other places. Paul knew from the appearance of this man that he belonged to the country of Macedonia. When he awoke from his dream he told his companions about the vision, and they believed, as he did, that God wanted them to cross over to Macedonia and preach the gospel there. So they bought passage on the first ship that sailed from Troas to Macedonia, intending to preach the gospel to the heathen people who lived there. Now another disciple, a doctor named Luke, joined Paul’s company, and sailed with him to Macedonia. This Luke afterwards wrote the “Gospel According to Luke,” and also the “Acts of the Apostles,” both of which are found in the New Testament. The first city of Macedonia which they visited was Philippi. Here they did not try to find the man whom Paul saw in his dream, calling for help. They knew the vision was meant to teach that many people were needing to know about Jesus, and they believed God had sent them to preach to all who would listen. In this city there were only a few Jews. They had no synagog, but the missionaries found a place outside the city where people met together by the riverside on Sabbath-days to pray. So on the first Sabbath they went down to the riverside. Only a few people were there and they were women. But Paul and his companions sat down and taught them more about the true God. Paul told them about the great gift that God had sent to men in his Son, Jesus. And while he talked, one woman, named Lydia, believed his words about Jesus and knew that her sins were forgiven. Then she was baptized in the name of Jesus. Her household also listened to the gospel and received it gladly. Lydia, the first Christian convert in the far country, now invited Paul and his companions to lodge in her house. She was a rich woman and she showed her gratitude to the missionaries by caring for them while they stayed in her home city.